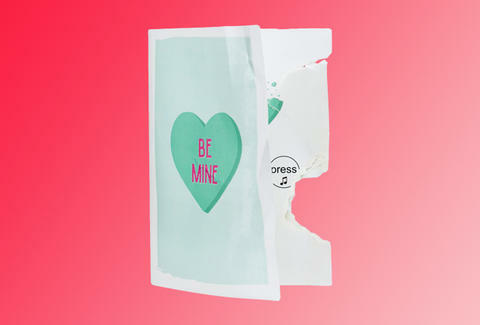 Are you looking for that special Valentine's Day card that says 'I Kind of Hate You'? Maybe you actually want to give a card to someone you hate. That seems unnecessarily mean, but you're your own person. Well, Firebox has something for you. It's easily the worst Valentine's Day card ever made. They're calling it The Never-Ending Valentine's Day Card. Once you open this spawn of Satan, it begins playing what they call a "horrendous" jingle and it won't stop. No, closing the card doesn't make it shut up. Nothing will. In fact, its battery will keep it going for up to three hours. Yay! The only way to make it stop is to actually kill it. You have to rip the card up and "smash the circuitry" to make it end. Oh, wait. What's this? The inside of the card is full of glitter? Yes. The music will stop, but now you're covered in goddamn glitter. But the glitter is heart shaped, so that's nice because of, you know, love. If your farting and terrible cooking didn't end your relationship, this will probably do the trick.